Crestwood Behavioral Health achieves our recovery-oriented outcomes through setting and adhering to optimal standards guided by best practices, core values and integrity. Our Recovery Outcomes data at Crestwood first begins with an idea and moves to a concept. It then becomes a conversation and moves to an agenda item. It then takes form and is named. It grows in the conceptualization and is reviewed by a variety of staff members. It is tested in concept for validity, reliability and ease of use for our staff, meaningfulness with our clients and evidence that it will work. It then becomes a pilot and is tested for 6 to 12 months. It is measured and observed for effectiveness and re-engineered based on effectiveness. It is then launched to all our programs and becomes a vital element of our Recovery Outcomes System. 327 trained DBT Crestwood therapists. 23 Crestwood programs implementing intensive DBT. Dreamcatchers Empowerment Network program is offered on 13 Crestwood campuses. 311 clients were employed through Dreamcatchers. We have 36 staff who are licensed Zumba Instructors and Zumba is offered twice a week at our campuses. 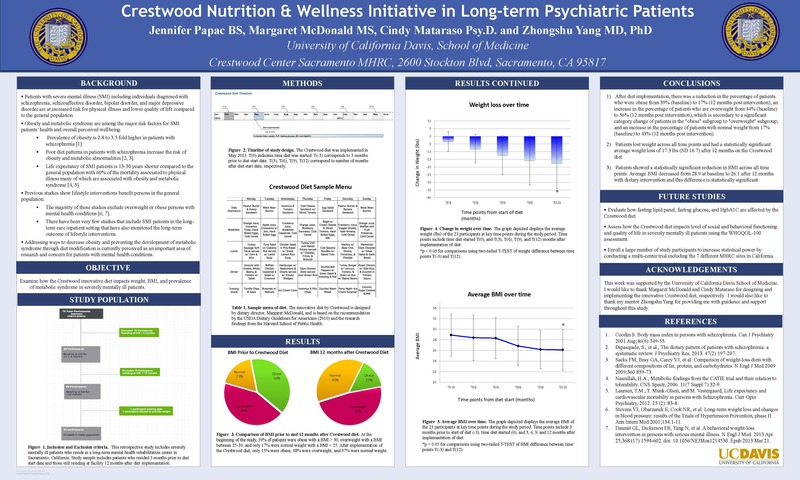 At the Sacramento Center Campus: Between May and August, 29 clients lost weight (between 0.8 to 19.8 lbs), 5 clients gained weight (between 0 and 6.2 lbs), and 1 client’s weight remained the same. At the Eureka Campus: Between June and September, 18 clients lost weight (between 1 and 17.2 lbs), and 7 clients gained weight (between 1 and 10.8 lbs). At the American River Campus: Between June and August, 11 clients lost weight (between 1 and 13 lbs), 10 clients gained weight (between 1 and 18 lbs), and 2 clients’ weights remained the same. At the Napa Valley Campus: Between March and May, 51 clients lost weight (between ½ to 35 lbs), 48 clients gained weight (between ½ and 37 lbs), and 7 clients remained the same. Crestwood and University of California Davis conducted a study for publication that indicates that these heart healthy diets contribute to the mitigation of diabetes and other metabolic diseases.